Good gym today. I upped the reps on my clean and press to 3x12 with the 25kg bar-bell, which was pleasing for my final run through that routine. I wanted to get to 3x8 with 30kg but I've just missed that target I think. Not down about it at all though, I've made some great progress with this routine and it's time for a new one. Favourite home-alone dinner tonight, even though I'm not home alone :o) I'm trying to shift a bit more fat %, get it down a bit lower so I'm on a lower calorie intake drive for a little bit and that means Prawnychilligarliclimething! It does exactly what it says on the tin; it's strongly flavoured, packed full of great nutrition, is wonderfully filling and warming, and takes almost no time at all to make. Finely chop the chilli pepper, peel and crush garlic and add both to the heated oil in a non-stick pan. While that's fizzling, chop the tomatoes into small chunks then add those to the pan with a little bit of salt and freshly ground black pepper. Bring to a sizzling point, add the lime juice and bring to a fierce bubble. Leave bubbling for 7-10 minutes, then add the prawns for another 4-5 minutes until the prawns are well heated through and the tomato mix has gone very soft. 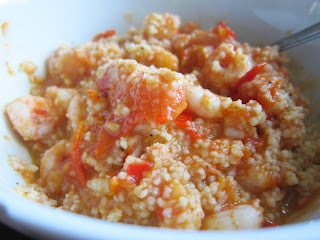 Serve with the couscous (cooked as per instructions on the packet - I usually sit 50g of couscous with a bit of seasoning in 120ml boiling water with a plate covering it for about 10 minutes, then fluff with a fork). I agree with Tam I will have to give this recipe a try!